Brought to you by the church of Christ in Buffalo Wyo. The purpose of the body of Christ as a whole, and the purpose and goal of the congregation of Christ in Buffalo, Wyoming, is to live according to God’s instructions, which He has given to us through His word, and to make known to the world, the gospel of Jesus Christ. Jesus did say.. “If you love Me, you will keep My commandments” Jn 14:15. One of His commandments is to “Go therefore and make disciples of all nations, baptizing them in the name of the Father, and of the Son, and the Holy Spirit, teaching them to observe all that I command you; and lo, I am with you always, even to the end of the age” Mat 28:19-20. It is our goal as individual Christians, as well as collectively as the local body of Christ, to fulfill the commandment of our Lord Jesus, by obeying His word and by spreading that word to all those that we meet. When the early Christians in the first century in Jerusalem, were dispersed because of the persecution, it says in Acts 8:4, “Therefore, those who had been scattered, went about preaching the word” That’s exactly what we are to do today. The best way to preach the gospel, and the way that has always been the best, is to do it one-on-one. Showing people that you care, by taking the time to be their friend, and by showing them that you love them, has always been the best way to spread the good news of Jesus Christ. One-on-one teaching, and personal involvement in the lives of others is how Jesus lived. He cared enough to always give of Himself, in order to serve others, and in order to teach others, personally. And that’s the way we too should teach others, personally. But each one of us cannot actually, “Go into all the world” can we? But we can reach the whole world, through the internet. What’s the purpose of this website? 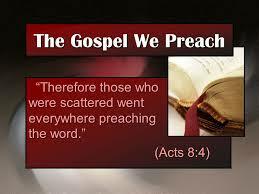 To go into all the world, and to preach the gospel to all creation. And it is our purpose, to do it as nearly one-on-one as we can. When you read the BIBLE ANSWERS that are given here, or some of the other bible lessons, just think of it as if we’re having our own bible study, in the privacy and comfort of your own home. We at the Buffalo church of Christ, want you to know that we love you as much as we love one another, here in our little town. And we want you to feel like a part of this website, by asking questions, and by leaving comments. Though we make our home in the small town of Buffalo, Wyoming, we live in the same world as you do. And people are just people, wherever you go. We pray that we all might help one another on our spiritual journey to heaven. Thank you, and may God bless you. Please leave your questions and comments at the bottom of any page. ASK A SPIRITUAL QUESTION is designed specifically for questions. You can also leave questions or comments at the end of any other page or post. I like your website and what you are promoting. Are you planning to market christian reading materials like commentaries and study bibles? Hi Lamont, thanks for visiting the website. I don’t have any plans right now for marketing anything. I do have some free bible study materials that I will offer here. My objective is to simply preach the word through this medium, and pray for hearts to be opened to the word. God has promised that if we sow the seed, He will give the increase. If you would tell others about the site and ask them to visit, you would be helping also to spread the word. May God bless your good efforts. Jim.